For Plans, if you bought the wrong item or you are not happy with your plans please call or email us. We give you a 30-day satisfaction guarantee. For hardware, please measure twice before opening your track tube, we do not take track returns once the tube has been opened. There is a 30% restocking fee on all of our hardware and it must be returned in good condition within 30 days. 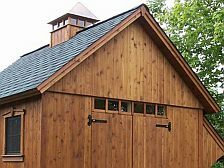 As much as we love barns, our Better Barns Hardware and Plans office staff are not truly experienced in the more complex types of barn construction questions you might have. We suggest you check these FAQ pages and consult with a local carpenter or contractor with your construction questions. At this time we do not do modifications or have any other plans than the ones listed on our plans page. 1. 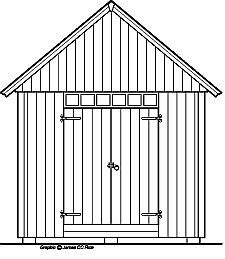 Please try the book Building Sheds and our DVD How to Build a Better Barn; they will be a big help with your building project. 2. Our plans are drawings and dimensions with a "Materials List" to help you shop for your project. We recommend the plywood sided plans for a beginner with some construction experience. The all cedar plans are more difficult and the English Potting Shed is beyond the expertise of the average homeowner. 3. What is the difference between the cedar and plywood versions on the plans? The framing and the siding material, and in some cases the location of the doors or windows. 4. For info about good quality nails try www.mazenails.com. For cedar siding and trim we use Maze 2 1/2" 8D split less siding nails which are zinc coated. When nailing pressure treated floor framing use galvanized Maze PTL anchor down nails. For pressure treated lumber use 3 1/2" 16-D. For roofing shingles use 1 1/4" galvanized roofing nails. For T-111 siding and 1/2" roof plywood use 2" galvanized box nails. For 3/4" plywood floor use 2 1/2" 8-D galvanized common nails. We use 3" Deck Mate square drive screws for framing, assembling wall sections, and for fastening trusses to the top wall plate. 5. DF stands for Douglas Fir lumber. We prefer DF kiln dried studs, but you can use any 2 x 4s. 6. We use 2" galvanized box nails to secure the plywood T-111 to wall framing. 7. We use maze galvanized split-less siding nails for cedar. 8. Except for use with the Wood storage addition #2022, we do not recommend a concrete slab or feel it is necessary. If you do pour a slab, be sure to make the outside dimensions 1" smaller than our floor base dimensions. Be sure to check the outside diagonal measurements carefully! You cannot correct once the slab is poured. 9. The base is purposely 4" shorter than the building length, so that when you get to the roof plywood everything works out and there is no waste. 10. Distance to peak on the colonial barn plans is 12' 3" on all 10 x plans and 13' 1" on all 12 x plans. Inside from floor to top plate on a 12 x 16 barn is 82-1/4". The siding length is 91". 11. We use four ground anchors when they are called for by Connecticut Building Code. Your state code may vary. 12. How long would it take a customer and one experienced man to build a 10x16 plywood sided barn? Probably about a week. 13. Can I switch from trusses to roof rafters? It is suggested that you follow the plan. 14. The framing is different on the cedar plan and the rough sawn plywood T-111 plan. 15. If you plan to side with vinyl or HardiPlank - use a plywood style plan. Instead of using the high end plywood use 1/2" CDX plywood for siding. 16. You can usually get perforated soffit locally through a large hardware or roofing material store. We use "musket brown" and cut it down the center along the "V" crimp. We buy Alcoa, but if you cannot find what you want look elsewhere. It is available. 18. 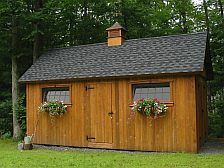 Which plan is the one on the cover of the book Building a Shed? It is plan #2015, a 10x16 all cedar colonial. 19. Split Use Colonial-Plan #2009 is 10x16 rough sawn plywood. You can choose to put the partition anywhere you want, or not use it at all. You can put the door on either end, either side or any combination. We offer this split use in a 12x16 Plywood Colonial Plan #2017 and all Cedar Plan #2020. 20. We finished the barn #2009 and #2022 with Benjamin Moore's paint color Cottage Red. See www.benjaminmoore.com for locations and info. 21. We finished the barn #2020 with a Cabot semitransparent Allagash stain. Check www.cabotstain.com for more information and store locations. 1. 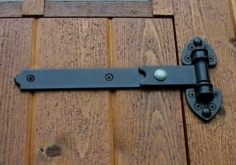 Hardware for our barn plans or any exterior project: "A pair" item #3012 is for a single door. For a set of double doors you will need two pairs. 2. 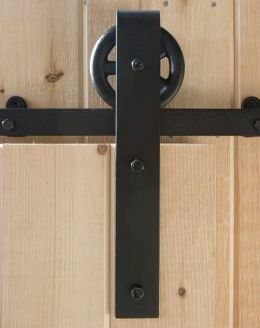 If you have double doors we do offer a set item #3014 which is two pairs of stainless steel black powder coated hinges with one ring latch set with lockable padlock eyes. 1. We can supply you with several sizes of hangers, handles, guides, stops as well as the standoffs and track. Made for exterior conditions but enjoyed for interior uses too. While interior sliding doors are a fad right now, much of the cheaper hardware available elsewhere will be garbage soon. Our hardware will be a piece of art from the past, lasting to be a family heirloom. 2. Our track sections are cut so they can be joined with a splice. Track can be purchased from us (in 4’, 5’, or 6' lengths). Usually the track length you need is approximately double the width of your door. 3. All of our hangers are very strong, the heavier the door the larger hanger but if your door is light and large and you like the look of our smaller strap or small horseshoe hangers they now roll indefinitely and carry a large door. Go with the look you like and feel free to email or call with any questions if you need more information on a particular hanger or part.